#253) CHARLES DURNING: Great War Hero, Great Actor, but Malmady Survivor? A few words of respect for Charles Durning who died on Monday at age 89. He was a great character actor, a tremendous military hero, and a really good guy (plus a Democrat) whom I got to spend a day with in 2004. But he leaves behind an interesting question: was he at the Malmedy Massacre? 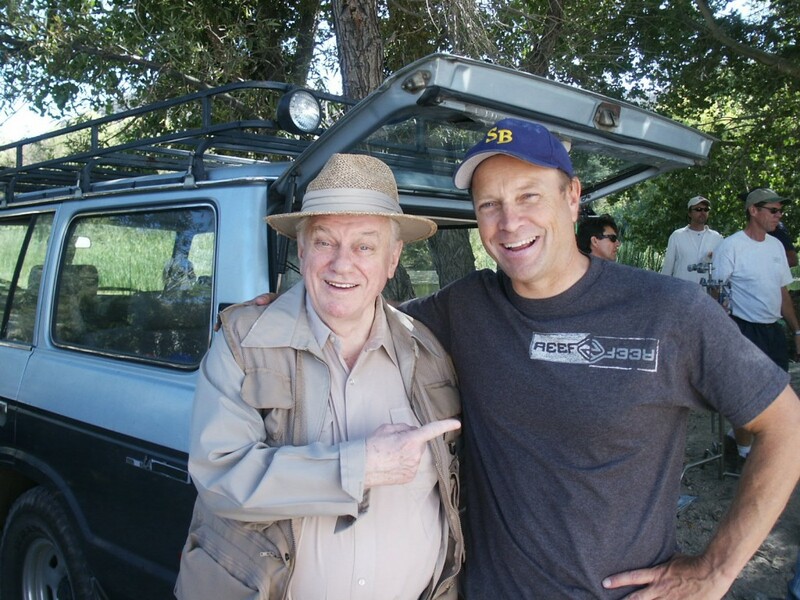 I got to direct a TV commercial for the Kerry Campaign in 2004 starring the late Charles Durning. More memorably, I had a great day hanging out talking World War II with him. There tends to be a correlation between the quality of character actors and how big of a character they are themselves. He was a great actor with a LOT of fascinating tales to tell. Hollywood is such a crazy thing. A guy goes and risks his life for his country, performs incredibly heroic feats in war, and when he finally passes away, the main thing he’s known for is play-acting movie characters ranging from a sketchy governor to a horny Nazi. Such is the life of Charles Durning. In 2004 I was lucky enough to spend a day directing him in a television commercial for the Kerry campaign. It was an awesome day. There were a few border states where mercury pollution in popular waterways was a serious issue, so the environmental folks in the Kerry campaign were eager to associate him with the efforts to combat mercury pollution. My old buddy Dr. Steven Miller (who was my partner in the Shifting Baselines Ocean Media Project and would eventually be executive producer of “Flock of Dodos” as well as the current Lionfish PSA Campaign), quickly raised the funds for me to write and direct a commercial for the campaign. Working through Hollywood contacts we heard that veteran character actor Charles Durning was a keen Democrat (even though his wife was a staunch Republican and literally tried to keep him from associating with us). He agreed to give us a day, I pulled together an amazing crew of industry veterans (including the very best cameraman I ever got the joy of working with — they were all Democrats willing to donate their time for the campaign), we found a location north of L.A., and within a couple days were out there filming. The net result was a commercial that was okay. It didn’t tell a devastating story the way the Obama commercial that I discussed a few weeks ago did. But it was thought be of value in the areas where they knew the mercury issue was relevant. Also, we got Paul Newman to do the voiceover which was fun — I directed him over the phone — but he did his performance at the end of a recording session for the animated feature, “Cars,” and he was very old by then so most people didn’t even recognize his voice (which was a lesson to me in voice talent). BUT WAS DURNING AT MALMEDY? The biggest joy of the experience was getting to spend the day chatting with Mr. Durning. He wasn’t just a run of the mill World War II veteran. He landed at D-Day, was in the Battle of the Bulge, and was part of the Malmady Massacre. At least that last bit is what he told me, in detail. 2004 was still pre-Wikipedia time, so I had little to go on when a friend told me to ask him about “Malmady.” But I did. And even though the obituaries now are saying he didn’t like to talk about his war experiences, he shared everything with me. Part of the reason he was willing to talk may have been because I told him some of my father’s war experiences from the Bataan Death March in the Philippines. The Malmady Massacre was a horrific event in which the Germans, after the Battle of the Bulge, rounded up and executed 80 American POWs. Mr. Durning told me he was in that group, but he and six other guys hid behind trees then escaped. According to Wikipedia, 43 men escaped. But interestingly, in the detailed Wikipedia discussion of Malmady, they conclude that Durning was not a part of the event. They are unable to identify his unit or any records of his being there, other than the French consul saying so in their 2008 presentation of the French Legion of Honor to him. The Wikipedia discussion argues that because there is no documentation, and more importantly, because so many accounts of what happened at Malmady are “embellished and inaccurate,” that he should not be cited as a survivor of the incident. I only know two things. First, no one doubts he was at D-Day and the Battle of the Bulge, but he also told me he was there at Malmady. He talked about how cold it was that day in the snow as they were hiding behind the trees. But second, last year I met with Gavan Daws who wrote the definitive book on Japanese Prisoners of War. He interviewed over 200 surviving P.O.W.’s. He told me he was fond of my father because he was, in his opinion, one of only a handful that he felt was actually telling the truth — most of the rest had either intentionally or unintentionally blown their stories up over the years into hugely embellished tales that contradicted each other and played loose with the facts. I really found that shocking to hear. It leaves you nervous about listening to the tales of war veterans. Then when you read about the increased skepticism these days in the legal system of the value of “eye witness accounts” of crimes, you do kinda wonder. And then you go and do a documentary feature film about the Bataan Death March (as I did last year and will begin screening on Feb. 14 at Brown University) and you end up gaining your own appreciation for the fact that history is just some agreed upon set of stories. Nothing more. Incredibly subjective. Which is strange. And then I flash back to Kathy Martin, the Kansas School Board Member in “Flock of Dodos,” who said she’s comfortable believing Washington was our first President because people were there to see that, but not comfortable believing fossils could be millions of years old because “nobody was actually alive that saw a lungfish crawl out of the water.” As if eye witness accounts were more credible than science. Sheesh. Crazy humans.